سازند شهبازان به سن ائوسن میانی تا پسین در شمال شرق پهنه لرستان گسترش دارد. برای مطالعه فرایندهای دیاژنزی سازند شهبازان پنج برش سطحی و چهار برش زیر سطحی در شرق پهنه لرستان انتخاب شده‌اند. مطالعه پتروگرافی بر روی 700 مقطع نازک، کاتدولومینسانس بر روی 40 نمونه، مطالعه با میکروسکوپ الکترونی بر روی شش نمونه وآنالیز میکروپروب بر روی 11 نمونه از دولومیت‌ها و برخی سیمان‌ها صورت گرفته است. فرایندهای دیاژنزی سازند شهبازان شامل دولومیتی شدن، سیمانی شدن، نوشکلی، فشردگی فیزیکی و شیمیایی، انحلال و دولومیت‌زدایی است. گسترده‌ترین این فرایندها دولومیتی شدن است. نحوه توسعه دولومیت‌ها جهت جریان سیال دولومیت‌ساز را به سمت جنوب غرب محدوده مطالعاتی نشان می‍دهند. از آنجا که دولومیت‌های سازند شهبازان زیر سازند آسماری قرار دارند، دولومیتی شدن در ائوژنز پیش از نهشت سازند آسماری روی داده است. سیمان‌های کلسیتی به جز بخشی از کلسیت بلوکی که در تلوژنز و کلسیت پویی‌کیلوتاپیک که در مزوژنز تشکیل شده‌اند، مربوط به پیش از دولومیتی شدن در ائوژنز متئوریک تا دریایی هستند. نوشکلی کاهشی در مرحله ائوژنز در قلمرو دریایی رخ است. فشردگی در ائوژنز توسط فشار روباره ناشی از نهشت سازند شهبازان ایجاد و در مرحله با نهشت سازندهای آسماری و گچساران توسعه یافته است. بخشی از انحلال در مرحله ائوژنز در قلمرو وادوز متئوریک و بخش دیگر با دولومیت‌زدایی و تشکیل سیمان کلسیت بلوکی در مرحله تلوژنز، پس از بالا آمدن زاگرس رخ داده است. به جز دولومیت‌زدایی و نوشکلی، دیگر فرایندهای دیاژنزی در همه برش‌ها مشاهده می‌شوند. Middle-late Eocene Shahbazan Formation is exposed in the Lurestan area (Zagros region). The diagenetic features have been studied based on the data from five surface sections and four additional exploration wells. This investigation was carried out on the petrography of 700 thin sections, Cathodoluminescence on 40 thin polished samples, Scanning Electron Microscope on six samples and Electron Probe Micro-Analysis on 11 thin polished sections. the most conspicuous diagenetic processes affected on the Shahbazan Formation are dolomitization, cementation, neomorphism, physical and chemical compaction, dissolution and dedolomitization, of which dolomitization is the most important. Dolomite distribution in studied sections suggest that fluid flow was probably toward SW of studied area, since the extend of dolomitization waning in this direction. Since the dolomites of the Shahbazan Formation are overlain by the Asmari Formation, the dolomitization predates deposition of the Asmari Formation and occurred in eogenesis. Majority of calcite cements deposited before dolomitization in eogenesis, excluding parts of the blocky and poikiotopic calcite which may form in telogenetic and mesogenetic realms respectively. Degrading neomorphism occurred in marine realm. Part of dissolution occurred in meteoric vadose of eogenesis. Compaction commenced in meogenesis with increasing over burden due to deposition of the Shahbazan Formation and culminated after deposition of the Asmari and Gachsaran Formations. Telogentic processes caused dissolution and dedolomitization of the Shahbazan Formation due to exhumation. by the exception of dedolomitization and neomorphism, other diagenetic features are occurred in all studied sections. پیریایی، ع. ر.، فیضی، ا.، صوفیانی، ح.، همت، س. و معتمدی، ب.، 1393- پالئوژئوگرافی نهشته­های ترشیاری زاگرس، گزارش داخلی مدیریت اکتشاف نفت، شماره GR-2362، 207 ص. حسن­زاده نعمتی، م.، 1393- مطالعه پتروگرافی و دیاژنز سازند شهبازان بین معمولان و پل دختر در استان لرستان، پایان‎نامه کارشناسی ارشد رسوب‌شناسی و سنگ‎شناسی رسوبی، دانشگاه بوعلی سینا، 132 ص. عبدل‎نیا، ا.، مغفوری‌مقدم، ا. و باغبانی، د.، 1396- چینه‎نگاری سازند شهبازان در حوضه لرستان، علوم زمین، سال بیست و ششم، شماره 103، صص. 157 تا 168. عبدی، ا. و آدابی، م. 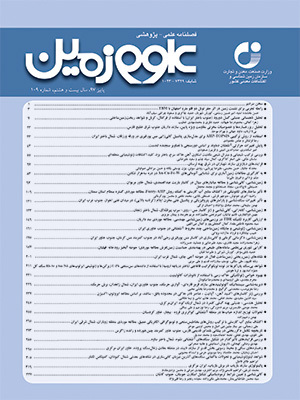 ح.، 1388- پتروگرافی انواع دولومیت‌ها، بررسی دیاژنز، مرز احتمالی سازند شهبازان- آسماری و تفکیک ریزرخساره­ها براساس ویژگی‌های ژئوشیمیایی دولومیکرایت­ها، شواهد پتروگرافی و روش­های آماری در برش دارابی (جنوب غرب ایران)، پژوهش‌های چینه‎نگاری و رسوب‎شناسی، شماره 25، جلد 1، 81 تا 100. محسنی، ح.، عبدالله‌پور، م. و رفیعی، ب.، 1394- عنصرسنجی، ساختار و نظم شبکه بلوری دولومیت بر پایه داده های سنگ‎نگاری XRD و XRF (بررسی موردی دولومیت‌های سازند شهبازان، جنوب غرب استان کرمانشاه)، مجله بلورشناسی و کانی‌شناسی ایران، شماره 23، جلد 1، صص. 43 تا 55. مدرس، م. ه.، 1388- بررسی فرایندهای دیاژنزی سازند شهبازان در برش سطحی کیالو، پایان‌نامه کارشناسی‎ارشد رسوب‎شناسی و سنگ‎شناسی رسوبی، دانشگاه تربیت معلم تهران، 83 ص. مطیعی، ه.، 1374- زمین­شناسی نفت زاگرس (جلد اول و دوم)، انتشارات سازمان زمین‎شناسی کشور، تهران، 1010 ص.
Alavi, M., 2004- Regional stratigraphy of the Zagros fold-thrust belt of Iran and its proforland evolution, American Journal of Science, V. 304, 1–20. Aleali, M., Rahimpour-Bonab, H., Moussavi-Harami, R. and Jahani, D., 2013- Environmental and sequence stratigraphic implications of anhydrite textures: A case from the Lower Triassic of the Central Persian Gulf, Journal of Asian Earth Sciences, V. 75, 110–125. Barker, C. E. and Kopp, O. C., (Eds. ), 1991- Luminescence microscopy and spectroscopy: qualitative and quantitative applications, SEPM Short Course 25. SEPM (Society for Sedimentary Geology), Dallas, Texas USA, 195 p.
Bathurst, R. G. C., 1975- Carbonate sediments and their diagenesis, Developments in Sedimentology, Elsevier Science, Amsterdam,. 658 p.
Buxton, T. M. and Sibley, D. F., 1981- Pressure solution features in a shallow buried limestone, Journal of Sedimentary Petrology, V. 51, 19–26. Choquette, P. W. and James, N. P., 1990- Limestone — the burial diagenetic environment. In: McIlreath, I., Morrow, D. (Eds. ), Diagenesis. Geological Association of Canada Reprint Series 4, St. John's, ND, Canada, 75–111. Dickson, J. A. D., 1965- A modified staining technique for carbonate in thin section. Nature, V. 205, 587 p.
Edmunds, W. M. and Walton, N. R. G., 1983- The Lincolnshire Limestone-hydrogeochemical evolution over a ten years period. Journal of Hydrogeology, V. 61, 201-211. Evamy, B. D., 1967- Dedolomitization development of rhombohedral pores in limestone, Journal of Sedimentary Petrology, V. 37, 1204–1215. Flügel, E., 2010- Microfacies of Carbonate Rocks, Springer, 984 p.
Folk, R. L. and Siedlecka, A., 1974- The Schizohaline environment: its sedimentary and diagenesis fabrics as exemplified by late Paleozoic rocks of Bear Island, Svalbard, Journal of Sedimentary Geology, V. 11, 1-15. Folk, R. L., 1974- The natural history of crystalline calcium carbonate: effect of magnesium content and salinity, Journal of Sedimentary Petrology, V. 44, 40–53. Granier, B., Clavel, B., and Charollais, J., 2016- Comments on "Estimating the impact of early diagenesis on isotope records in shallow-marine carbonates: A case study from the Urgonian platform in western Swiss Jura" Carnets Geol, V 16 (17), 417-429. Hiatt, E. E. and Pufahl, P. K., 2014- Cathodoluminescence petrography of carbonate rocks: a review of applications for understanding diagenesis, reservoir quality, and pore system evolution. In: Coulsen, I. M. (Ed..), Cathodoluminescence and its Application to Geoscience.,Mineralogical Association of Canada, 75–96. James, G. A. and Wynd, J. G., 1965- Stratigraphic nomenclature of Iranian Oil Consortium Agreement Area, American Association of Petroleum Geologists Bulletin, V. 49 (12), 2182-2245. James, N. P. and Choquette, P. W., 1990a- Limestone — the meteoric diagenetic environment. In: McIlreath, I., Morrow, D. (Eds. ), Diagenesis, Geological Association of Canada, Reprint Series 4, 35–74. James, N. P. and Choquette, P. W., 1990b- Limestone — the sea floor diagenetic environment. In: McIlreath, I., Morrow, D. (Eds. ), Diagenesis, Geological Association of Canada Reprint Series 4, 13–34..James, N. P. and Jones, B., 2015, Origin of Carbonate Sedimentary Rocks, Wiley, American Geophysical Union, 464. James, N. P. and Jones, B., 2015- Origin of Carbonate Sedimentary Rocks, Wiley, American Geophysical Union, 464 p.
Jones, B., 2007- Inside-out dolomite, Journal of Sedimentary Research, V. 77, 539–551. Kasprzyk, A. and Otri, F., 1998- Palaogeography and burial controls on anhydrite genesis: the Badenian basin in the Carpathian Fore deep (southern Poland, western Ukraine), Sedimentology, V. 45, 889-907. Land, L. S., 1985- The origin of massive dolomite, Journal of Geoscience Education, V. 33, 112-125. Murris, R. J., 1980- Hydrocarbon habitat of the Middle East, American Association of Petroleum Geologists, Memoir 6, 765-800. Nader, F. H., Swennen, R. and Keppens, E., 2008- Calcitization/dedolomitization of Jurassic dolostones (Lebanon): results from petrographic and sequential geochemical analyses, Sedimentology, V. 55, 1467–1485. Reid, R. P. and Macintyre, I. G., 2000- Microboring versus recrystallization: further: insight to the micritization process, Journal of Sedimentary Petrology, V. 70(1), 25-28. Schneidermann, N. and Harris, P. M., (Eds. ), 1985- Carbonate cements, SEPM Special Publication 36, 408 p.
Sibel, M. J. and Jones, N. P., 2017- Diagenesis of Miocene, incised valley-filling limestones; Provence, Southern France, Sedimentary Geology, V. 347, 21–35. Sibley, D. F. and Gregg, J. M., 1987- Classification of dolomite rock texture. Journal of Sedimentary Petrology, V. 57, 967- 975. Swennen, R., 1986- Lithogeochemistry of Dinantian carbonates in the Vesdre basin (Verviers synclinorium: E Belgium) and its relations to paleogeography, lithology, diagenesis and Pb-Zn mineralizations. Academiae Analecta, Klasse der Wetenschappen, V. 48, 67–108. Tucker, M. E. and Wright, V. P., 1990- Carbonate Sedimentology, Blackwell Scientific Publications, Oxford, 482 p.
Tucker, M. E., 1991- Sequence stratigraphy of carbonate-evaporite basins: models and application to the Upper Permian (Zechstein) of northeast England and adjoining Noth Sea, Journal of the Geological Society, London, V. 148, 1019-1036. Vahrenkamp, V. C., Swart, P. K. and Ruiz, J., 1991- Episodic dolomitization of Late Cenozoic Carbonates in the Bahamas: Evidence from strontium isotopes, Journal of Sedimentary Research, V. 61, 1002-1014. Warren, J. K., 2000- Dolomite: occurrence, evolution and economically important association, Earth- Science Reviews, V. 52, 1-81. Warren, J. K., 2006- Evaporites: Sedimentes, Resources and Hydrocarbons, Springer-Verlag, Brunei, 1035p. Wilson, A., Sanford, W., Whitaker, F. and Smart, P., 2001- Spatial patterns of diagenesis during geothermal circulation in carbonate platforms, American Journal of Science, V. 301,727-752.